On April 18th, 2017 through a unanimous vote, the Woodhaven Brownstown school district awarded Trinity Transportation a contract to provide student transportation for the next 3 years. The 3-year contract will take effect on July 1st, 2017. Trinity Transportation will handle over 34 school bus routes throughout the school district. “After meeting with several transportation providers, Trinity Transportation was highly recommended based on their high reliability, and well-respected reputation providing transportation services to more than 35 school districts and 10,000 students daily,” says Mark Greathead, Superintendent of Woodhaven-Brownstown school district. “We are excited to be awarded the Woodhaven-Brownstown contract and look forward to providing excellent transportation to the students, parents and members of the community” says President Jerry Sheppard. Trinity Transportation continues to provide professional, safe, and reliable transportation for over 35 years! Trinity currently serves over 100 school districts and safely transports more than 10,000 students throughout southeastern Michigan. Trinity currently has 10 different terminals throughout Southeastern Michigan and Northern Ohio. 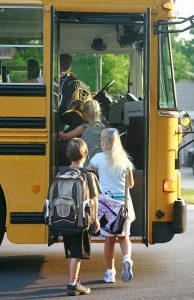 Along with school bus operations, Trinity provides Motor Coach and Sedan services, too.